Indeed, this is taking place in many African countries, also here in Mozambique where I am living. I is done at a huge scale with various pension funds and hedge funds all over the world investing in African land. Traditional peoples are removed from their ancestral land, while governments falsely are saying that the land is free and available. I would assume that the middleman making the deal between the foreign investors pay generously into the wrong bank accounts since politicians are becoming rich. Environmentally it is a disaster. The African top-soil is not deep, thus introducing chemical agriculture will destroy the soil rather quickly. The scientific way of growing crops requires irrigation using up the limited water resources in Africa. Genetically modified biotechnology will curb the essential African bio-diversity that has nurtured people for thousands of years. Due to exhausted soils, salt build-up, overuse and exposure of naked soils, we may experience in the not too far future that the Sahara desert will increase in size while millions of people will die. At the moment we see starving people in Ethiopia - this happens just next to huge land areas allocated to foreign investors! It is all done for profit making to the elite. Also normal pensioners in the North are benefiting without their knowledge. I saw the list of investors and found that also a respectable Danish (I am Danish) pension fund was among the investors! This is deeply disturbing. It is called "agriculture" because food production is a culture, it is not an "agribusiness" for profit making activity. I am disgusted about the world's political and economic elites. They have reached the limit here. Thank you dear Cal for bringing this important issue to people's attention. I will add this article to the others I carefully file. Yeah... people's greed knows no limits. The 'Human Project' needs a thorough upgrade. Add this to the world's file of "stupid" stories. Greed greed and more greed. Looks like the CEO and others at Michelin just made the greedy lowlife people to kill list ! Sigh. It's been done before. Colonialism with a different name. Just as the rich create more problems for the poor, the richer countries create more problems for the poorer countries. The money spent in aid will never replace all of the resources stolen and suffering caused. The more the African people are" sold down the river" by corporations the worse it will get. I'm sure Monsanto has their eyes on Africa as well if there not already trying to control the see production. well surprise, surprise. I have an African-American friend who lives in Oakland. Oakland used to have a large Black population, but she says now it is being gentryfied, and who knows where the poor have been shoved away to. Apparently the same thing with New Orleans. Blacks were uprooted by Katrina and the gentry took over. With money to spare, houses are all fixed up. Landlords tend not to fix up houses for renters, and are more than happy to sell. Maybe it makes sense in a way, although on the other hand, it doesn't feel right. We are a country founded on two opposing ideals- that of freedom and that of looking out for number one and getting the competitive edge over anyone not as sharp, or with less power/resources. That the universities are doing land grabbing out of the goodness of their academic hearts is total B.S. Universities are in the BUSINE$$ (of education), and not into philantrophy. Otherwise, they would allow seniors and others to audit classes gratis or sliding scale. Those uncaring people who are involved in robbing the poor African farmers of their land will ultimately reap a bitter harvest for themselves. Much better to help them, and reap a good harvest. It's also more fun, and the rewards are much greater. Thanks Cal--this seems to be the story of Africa's history. 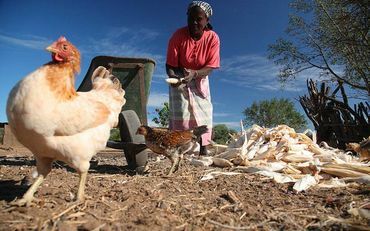 In South Africa the previously disadvantaged people are getting their land back. Yes the apartheid took their land and started agriculture and fed the nation. Now approximately 70% of the land that are given back to the poor souls is becoming waste land or rather deteriating because the people sit and expect for crops to grow by itself. One must WORK too!. Displacing people from their own land through flattery and greed.